Cast the cold aside with 2-up seating, standard windshield, heated grips, and mudguards—that's the 2019 Outlander MAX North Edition. Wider, revised suspension makes the most of legendary Rotax power and tows up to 1,650 lbs (750 kg). 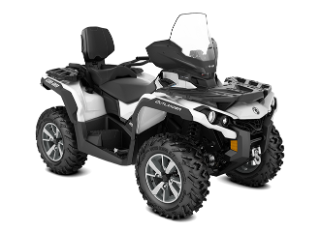 Available with a 62 hp Rotax 650 or 78-hp Rotax 850 V-Twin engine, the new Outlander puts all that torque to the ground with responsive throttle, a signature roar, and power to spare. Renowned for flexible reliability in harsh conditions and easy maintenance, Rotax engines have seen every corner of the world—and that's not a boast.